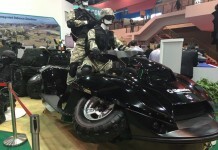 A new robot at the show is new weaponized version of the Amstaf from Automotive Robotic Industries (ARI). The company has already displayed the security guard version in the past, and the system is currently being evaluated for airport security missions. 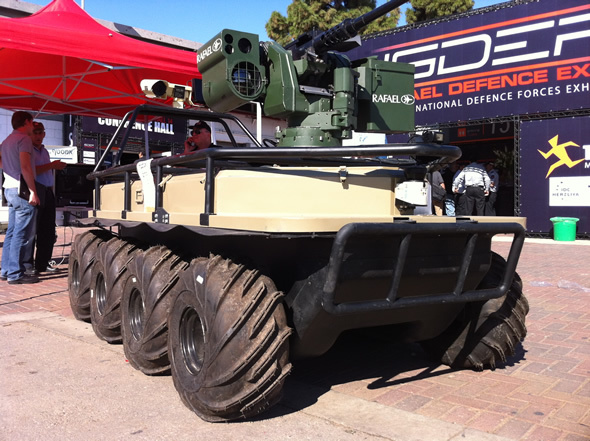 Amstaf on Guard provides a robotic, autonomous platform that can be configured with mission specific sensors, supporting perimeter defense elements such as a smart fens, radar and motion detection systems. Other Amstaf configurations may include CBRNE, fire and EOD sensors and neutralizers as part of their payloads. The vehicle has already been operated patrolling the area south of the demilitarized zone in South Korea, where a patrol version using a telescopic mast was recently fielded. The combat support vehicle represents ARI’s concept of a vehicle combining the fire support and load carrying platform (mule), supporting dismounted infantry teams. 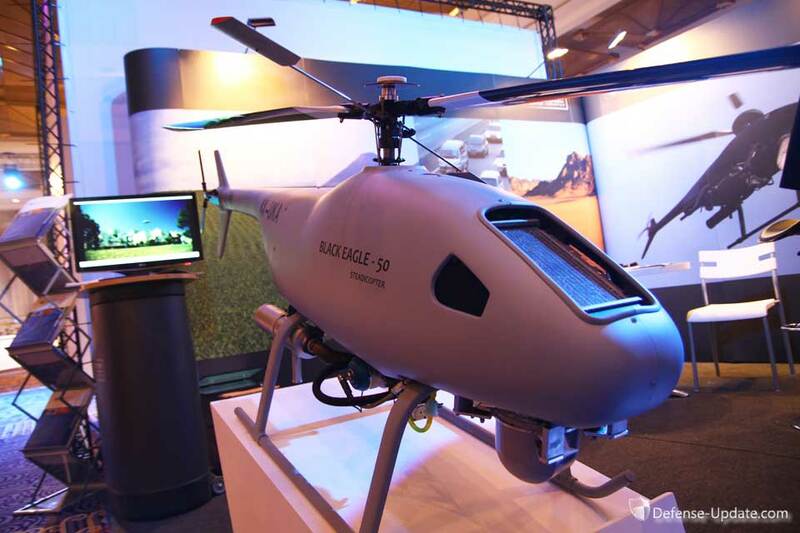 “Amstaf provides an effective and versatile autonomous platform that can assume different roles in support of military and special operations units” said Amos Goren, founder of ARI. 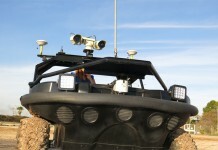 “Fitted with a remote weapon system and sensors, it can be used as an unmanned forward watch or pathfinder, replacing today’s manned vehicles and scouts. 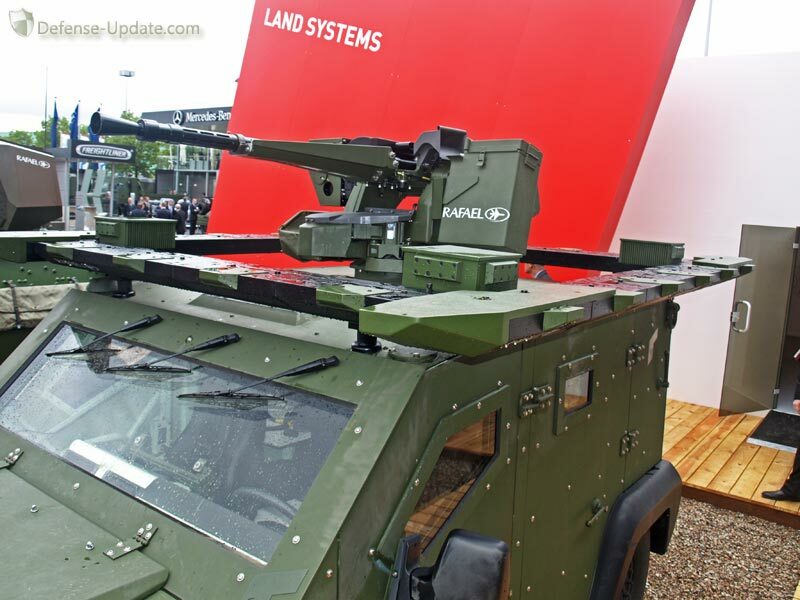 The same platform can be reconfigured in the field to carry supplies supporting dismounted teams, carry and launch guided weapons or transport wounded soldiers to safety, without risking the lives of more soldiers.” Goren added. Guidance and control of tactical robots will be performed using a Toughbook laptop computer or wrist-mounted controller, with the Amstaf understanding basic commands like ‘halt!’, ‘follow me’, for simple coordination with dismounted teams. When operating as observation outposts or mobile forward watch, the robot could be operated from fully equipped control systems already developed for the Amstaf On Guard system, enabling maximum flexibility and functionality. Amstaf on Guard is built to sustain up to 24 hour continuous duty cycles, with the combat support version supporting continuous missions of six hours offering quiet, stealthy operation. The vehicle has an integrated generator supplying 2.5KVA for 18 hour mission. When extended quiet missions are required a quick charge is needed, an external quick charger can top up the batteries for extra four hours in just 15 minutes. 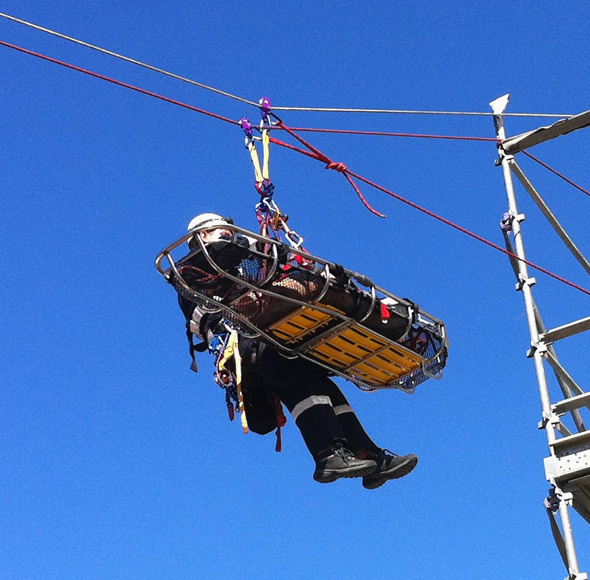 The vehicle weighs 900 kg and carries 850 kg plus one ton tow capability. the vehicle has a maximum speed of 32 km/h on land and 5 km/h swimming.